Since my blog name is "Stampin' quilter", I thought I'd show the "stampin'" part of me :) I've been rubber stamping for many years. 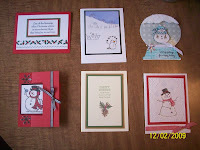 Every Wed I get together with a group of ladies to create cards & just have a fun time. Then often on Fridays I get together with another friend to do cards too. Since September we've been working on our Christmas cards. Here's a sample of a few of mine. I make several designs instead of all the same for Christmas. Started addressing the card last night ! Yay -- the Stampin' side of Stampin' Quilter emerges in blog-land! These are lovely, as are all of Barb's cards. I know, I've received some over the years. They are very special, and I'm spoiled. I cannot ever buy another Hallmark card again! Wow...those are beautiful works of art! I've done a little stamping over the years, but just don't have the knack for it I don't think. Very nice! Those cards are all WONDERFUL!!! I can't do nice cards...wish I could, but I can't get the hang of it. Yours are totally beautiful. Thanks for showing them....whoever gets them is very lucky!!! Beautiful BEAUTIFUL cards!!! much more personal to recieve than over-the-counter cards..great job! Love the cards...the snow globe is my favorite!! You are one talented lady! What pretty cards...I love the snowman in the Winter Wonderland card!! I just went to my first "Stamp Camp" and enjoyed it though I'm not very creative that way. What a nice treat for those who are treated to your original cards. Barb, do you ever carve your own stamps? I use some stamps to add texture and designs to my paintings. Since I didn't want to worry about copyright issues with paintings, I started carving my own stamps for that. If you haven't tried it yet, you should. It is lots of fun. Just expect to mess up some before you "get it." I am a stay-at-home wife , mother, & grandmom. Life is good. Grandma's Kitchen #10 and 11 and finished Design Boards! It's my FAVORITE time of the year! !